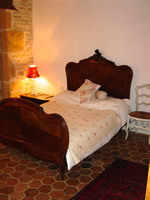 Bedroom with antique french walnut double bed with matching wardrobe, and en-suite shower room, with wc, bidet, shower and wash hand basin. Boiler Room also housing pool filtration system etc. Large utility room/playroom with washing machine and full sized table tennis table. Accessed by a beautiful flight of stone steps and covered balcony is the large Sitting Room with Kitchen, with wonderfully high ceilings. Kitchen includes 6 ring gas range cooker, electric oven, microwave, dishwasher, tall fridge/freezer, kettle, toaster and extensive storage space within units and a massive period 1820’s walnut cupboard. The main sitting room/dining room/kitchen has exposed stone walls and oak floor joists, beautiful 1450 carved stone fireplace, original stone sink, palmette flooring, antique sofas, chairs and 17th century furniture. The refectory table seats 10 people comfortably. TV (main English channels) and DVD. Broadband available from Summer 2010. Corridor leading to separate wc and Bedroom with beautiful French antique walnut double bed and en suite bathroom with bath (shower over), bidet and twin wash basins. 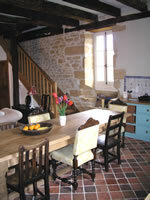 French door opens out onto flight of stone steps leading to terrace and pool. Landing giving access to three bedrooms, two, each with a pair of twin beds and one with a double bed. Antique French iron cot bed and modern travel cot available. Separate shower room with enclosed shower, wc and wash hand basin. Please note; whilst we welcome children of all ages to Le Coustalou, they must be supervised at all times.